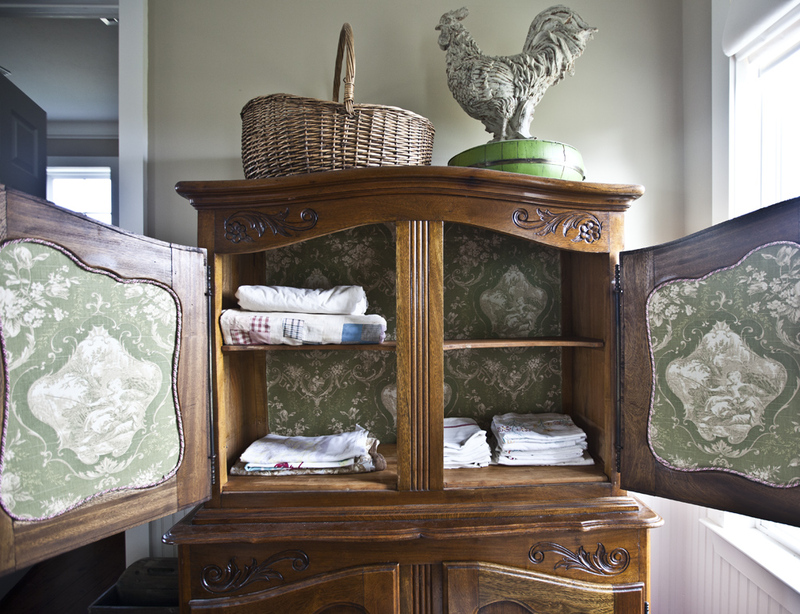 Country French design is full of French baskets. Some of my baskets are French baskets, some are English and others are American. Some are new, some are old, and some are very old. 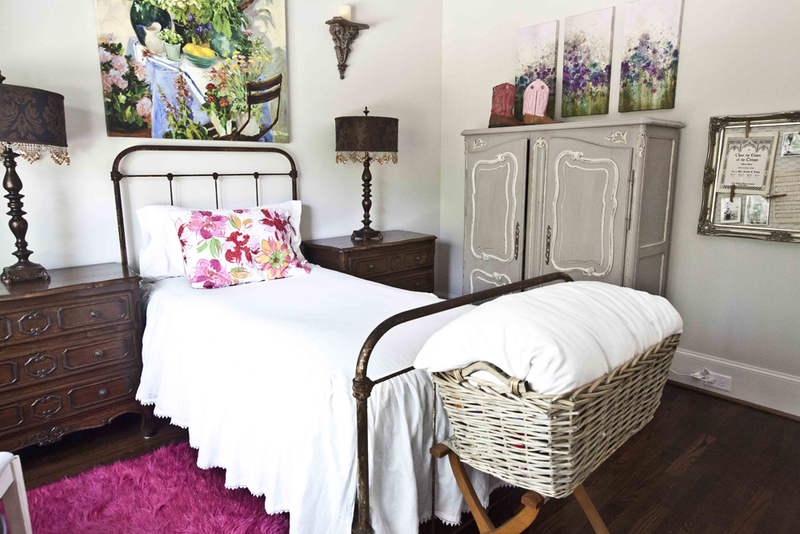 One thing I want to point out is that the basket does not have to actually be French to give a room a French feel. I love using them in a room to organize things and just make the space prettier. I went through my archives and brand new photos to find examples of how I use baskets and I came up with some common themes. Apparently I really like to use them at the foot of a bed. I use one at each of the these beds at the farm. Throws at the foot of the beds and in the baskets were provided by Turkish T.
These baskets are lined which is a lovely touch. 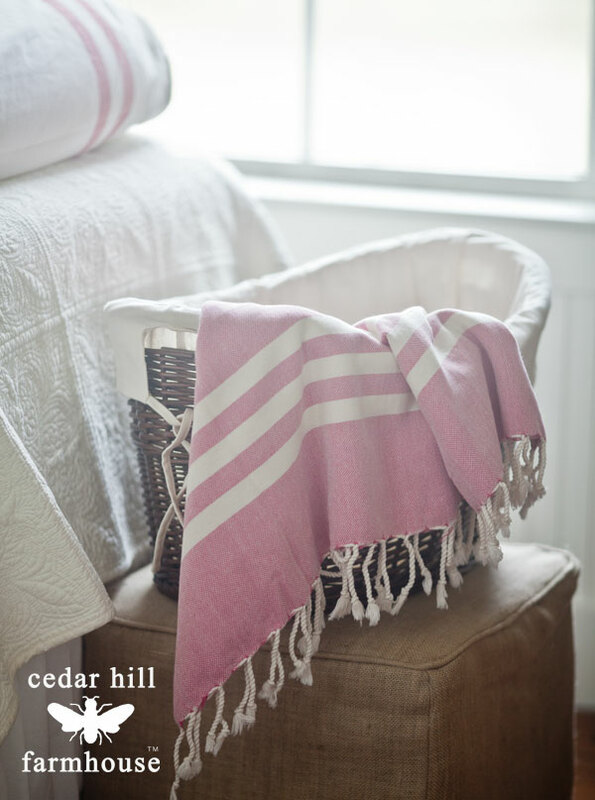 At the foot of my daughter’s bed, below, I used a small basket on a luggage rack to hold extra linens and a pillow. 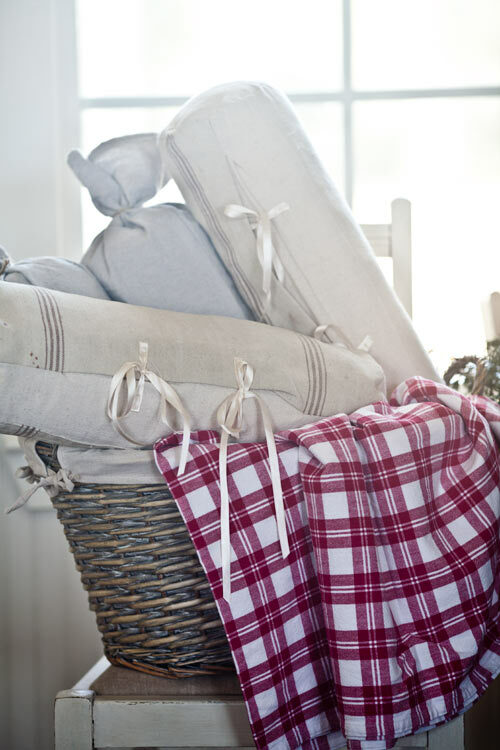 At the foot of a bed at the farm, I use a basket to hold extra pillows and a throw. The guest room also boasts a wicker trunk at the foot of the bed for extra linens. My daughter’s bed also has a wicker trunk, or basket for holding extra linens. Wait, no, another basket? Yes there was one at the foot of our bed also. I recently replaced it with a bench to break up the whole ‘basket at the foot of the bed’ thing. I use them in at our farm kitchen to hold utensils and other things. I use them on the wall to hold some extra wheat I am getting ready to grind so I can make homemade bread. NOT REALLY; it is purely there for decorative purposes. 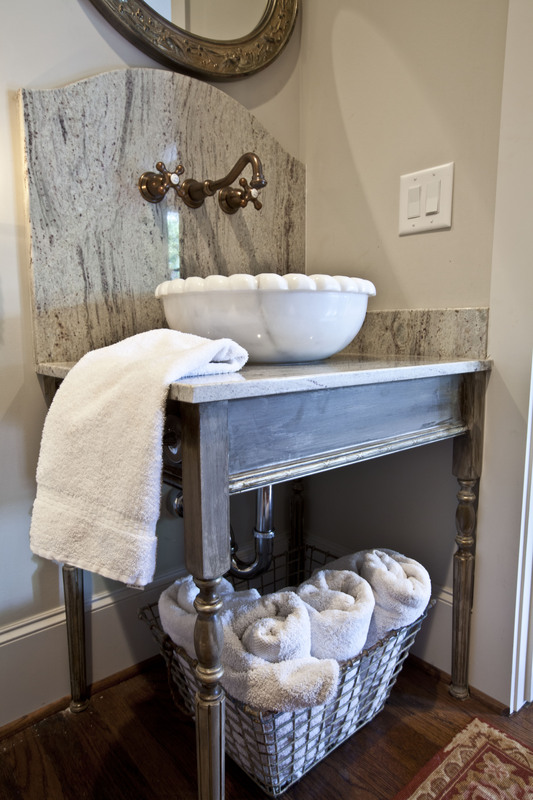 I also use this French wire oyster basket to hold towels in our guest bath under the vanity. Then I have a basket on top of our linen closet/armoire. 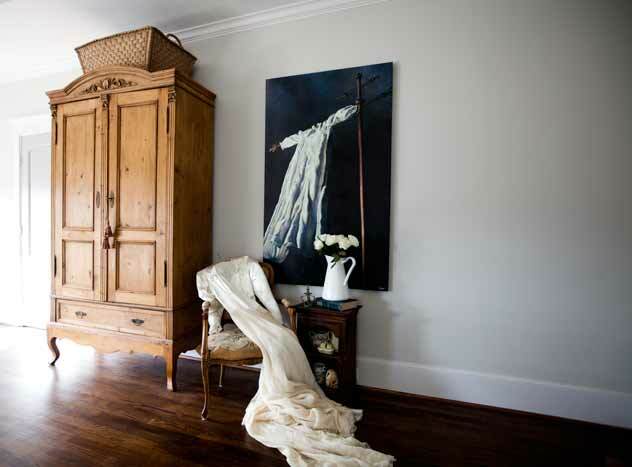 A French laundry basket sits on top of this French pine armoire. 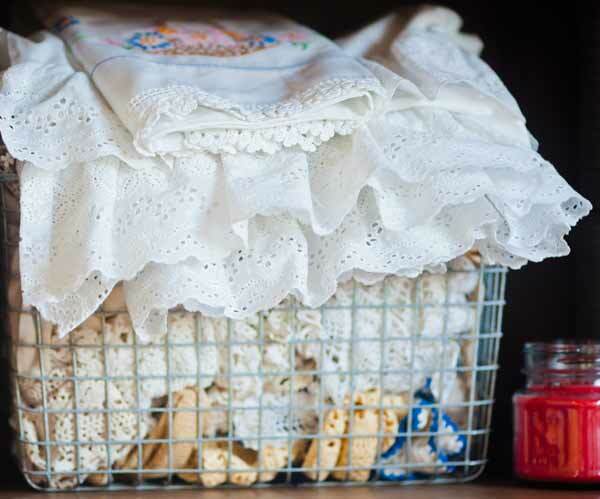 I use vintage wire gym baskets to hold craft supplies. Of course I use a wicker laundry basket in the laundry room. I used baskets to hold extra pillows. And yet another basket on top of furniture! How about a wicker tray? It’s a type of basket… sorta… maybe. 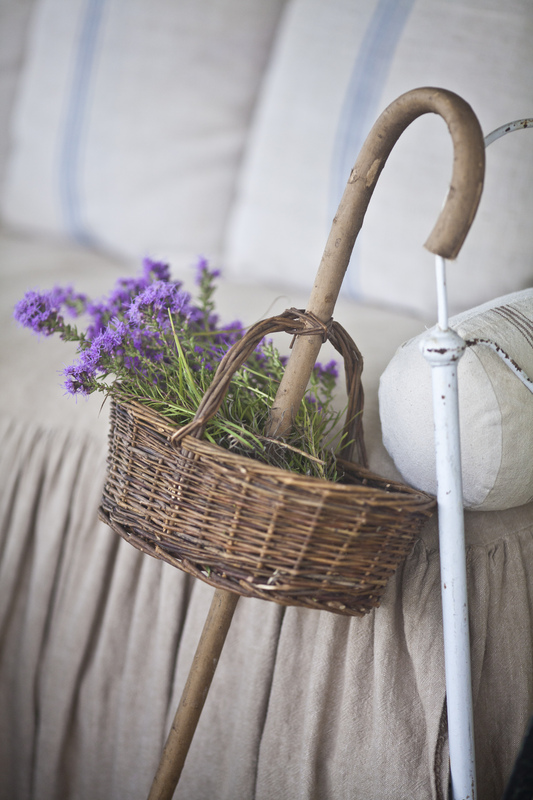 Then there is my flower gathering basket on a walking stick. I use this one all of the time to gather flowers from the pasture. 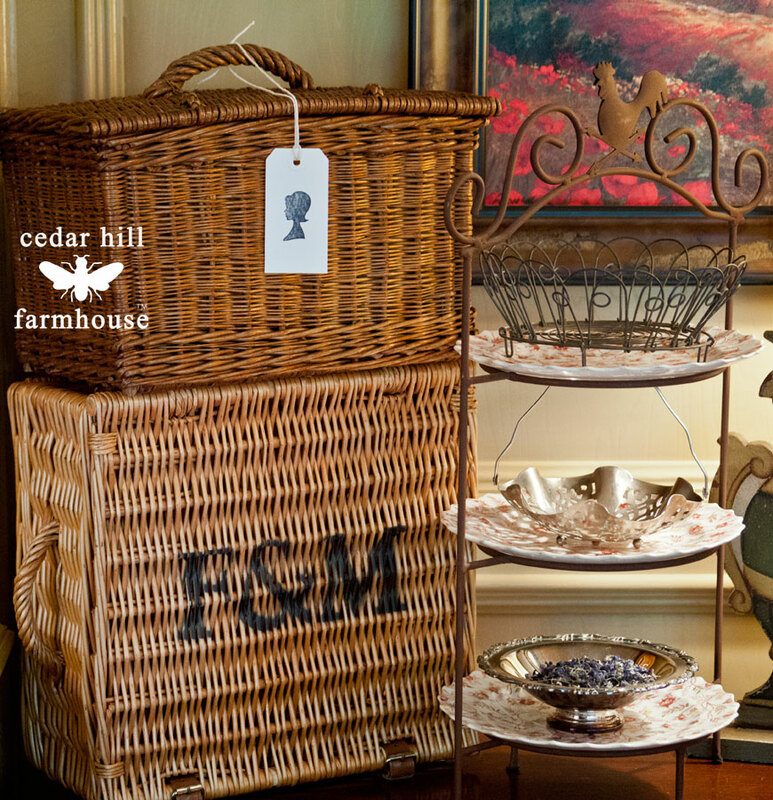 Below I have a sewing or picnic basket on top of a Fortnum and Mason basket. And then there are the baskets under tables. The one below is another, smaller Fortnum and Mason hamper my husband brought back from London recently. It was full of yummy goodies, most of which have already been eaten. 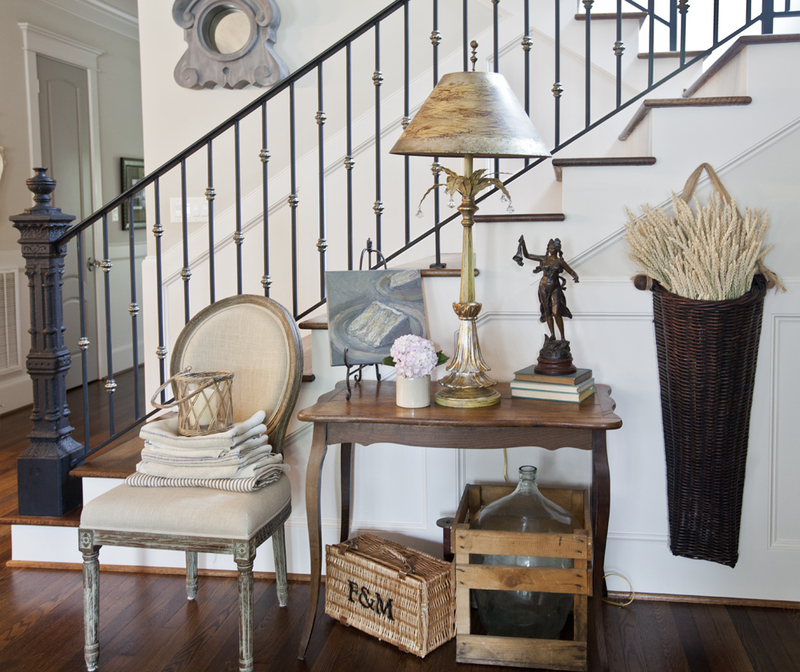 I hope this gives you lots of ideas about how you can use baskets in French decor. 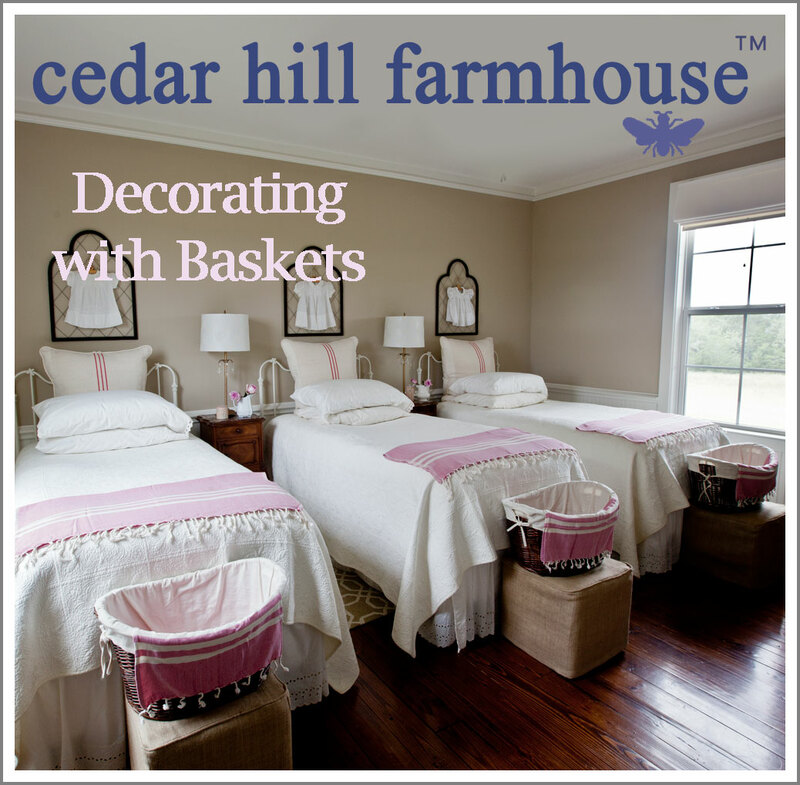 Remember to go check out how my friends used baskets in their country French homes. You have some beauties, Anita. Beautiful Anita. I love your collection of gorgeous baskets. 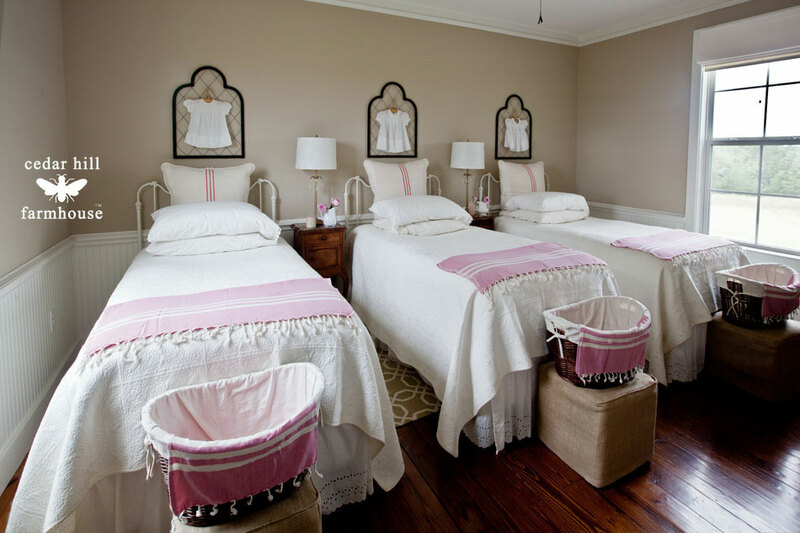 The baskets at the ends of the beds are adorable. Your baskets are very charming Anita! Anita: You must be the queen of baskets and how to use them! They are all lovely and so appropriately used. Love them all…a really fun post to read today! 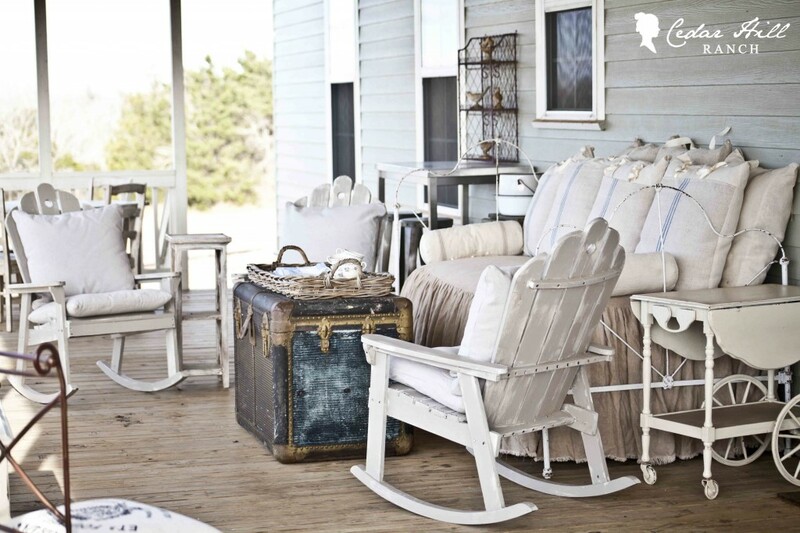 Such beauty you create, as for your Charles P. Rogers bed I had this very same bed 13-years ago. I then used in in a model home that sold with the bed. Your baskets are terrific and you use them well. Thanks so much for sharing this post with us. Really gives me some wonderful ideas. 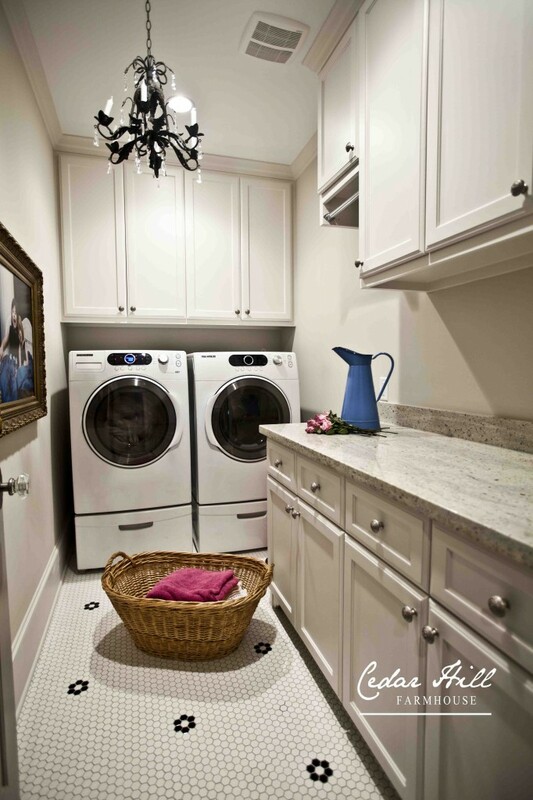 I love all the baskets, but your laundry room is to die for. All that cabinet space and that countertop! Love! Love all the baskets! Love your home as well! 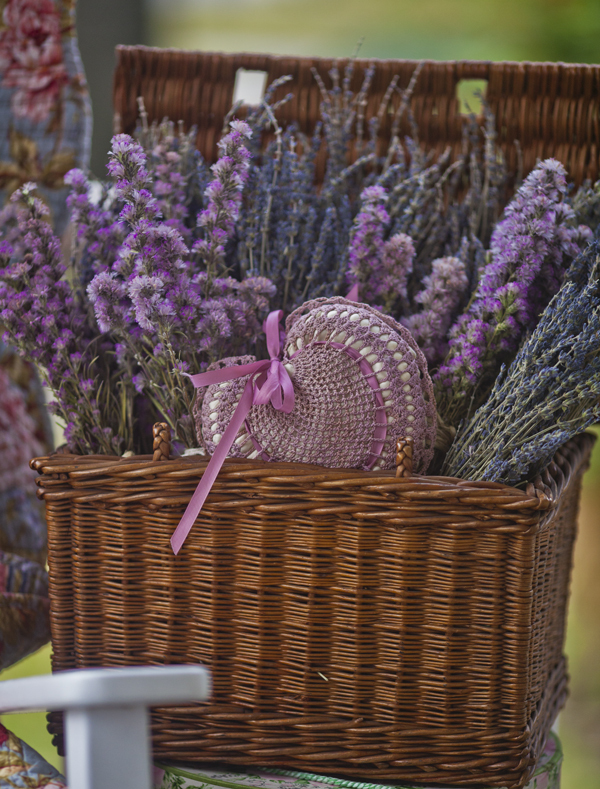 Baskets….Reminds me of Linsey. She has them everywhere for all kinds of useful purposes. 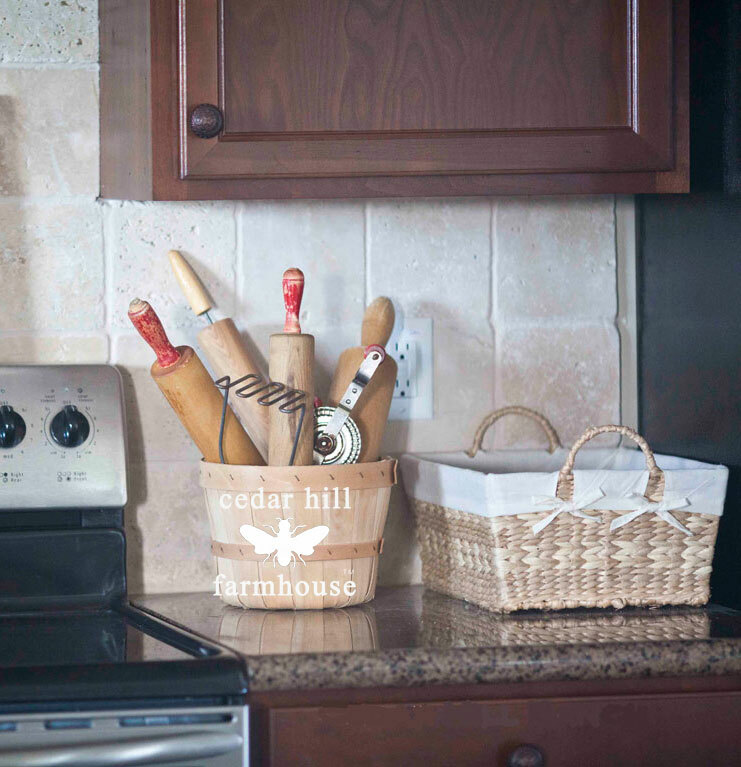 Like you, I love to use baskets old and new in my home for beautiful storage. You have give me some great ideas to use them in even more places. loving your posts as always. Ha, ha Arleen, it still works great! 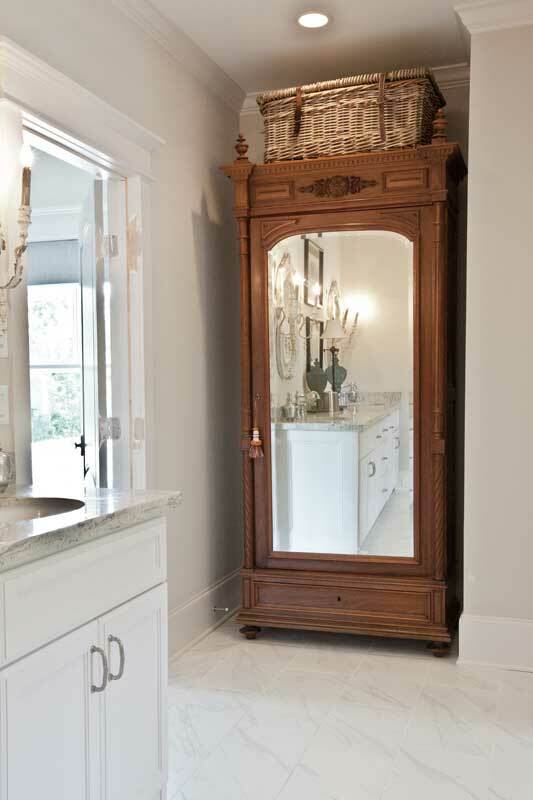 What a beautiful laundry room!! !